Off to Houston in a few days for cell artwork showings at the Health Museum and the DAVinCI Visualization Wall. It will be the first time I’ve seen the art printed full size (48in by 36in) or on the Wall (cropped and downsampled to 7686px by 4326px). A bit nervous, but grateful and happy. 3D videos of Qutub Lab’s microscopy cell images will be shown on the Wall, as well as the art. Having worked with the cell images for the past six months, I’m eager to see the lab’s videos. They’ll be fascinating and exquisite. Going forward: I now have access to microscopy images of zebrafish, striped members of the minnow family with see-through embryos. I’ll study the lab’s images before I leave for Houston and, perhaps, I’ll have some art ideas by my return. 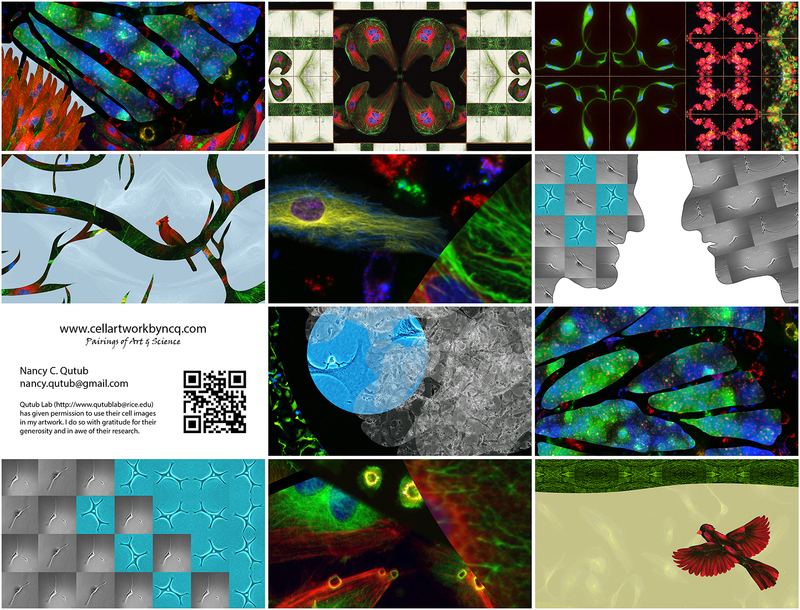 Qutub Lab (http://www.qutublab.rice.edu/) has given permission to use their beautiful cell images in my artwork. I do so with gratitude for their generosity and in awe of their research efforts. This entry was tagged arts, cell art, cell artwork, cell images, microscopy images, Nancy C Qutub, Nancy Qutub, science. Bookmark the permalink. gorgeous.� I’m so proud of you. Thank you, Pam. Your encouragement matters.